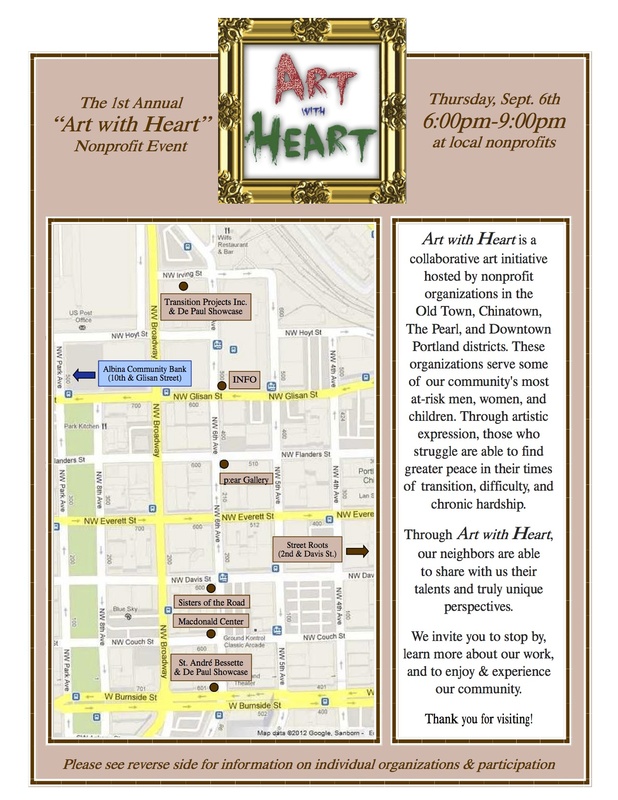 Art with Heart is a collaborative art initiative hosted by nonprofit organizations in the Old Town/Chinatown, The Pearl and Downtown Portland districts. On September 6th, in partnership with the 1st Thursday Art Walk, organizations working with people experiencing poverty will showcase artwork provided graciously by their clients, guests, partners, and supporters. Saint Andre Bessette, p;ear, Transition Projects Inc., Central City Concern, the MacDonald Center, Sisters Of The Road, DePaul Treatment Center, the Albina Community Bank (Pearl) and Street Roots will all be showcasing artwork from and about the streets and social justice. These organizations serve some of our community's most at-risk men, women, and children. Through artistic expression, those who struggle are able to find greater peace in their times of transition, difficulty, and chronic hardship. Stop by any of the locations to enjoy and experience community. See a map below of participating organizations.